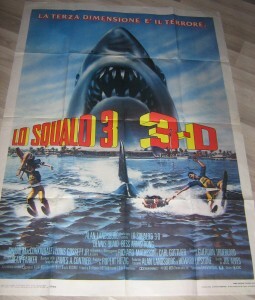 Partager la publication "Affiche Lo Squalo 3 3-D (Italie/1983)"
JOYEUX ANNIVERSAIRE GRAND CHEF !!!!!!! "jaws-3d.com" is Copyright © 2009, 2015 Romain Christmann. All Rights Reserved. "Jaws 3-D" the motion picture is copyright 1983 by Universal Pictures, Alan Landsburg Productions, MCA theatricals. This Die hard fan web site was neither created nor endorsed by Universal; it is intended solely for informational and research purposes only. No copyright infringement is intended.